One of the world’s most respected exponents of Gypsy Jazz guitar since Django Reinhardt, Englishman Robin Nolan’s story began in an evacuation hospital in Vietnam in 1968. The son of musical entertainers, Nolan’s nomadic lifestyle has taken him on a romantic and passionate musical journey that’s rarely travelled in these fast-moving, fame-obsessed times. You might even call it a modern-day fairy tale. Spending his formative years in Hong Kong, Nolan’s Liverpudlian father started to teach him to play the guitar at the age of six, unselfishly hoping his son’s talent would go on to shine even brighter than his own. 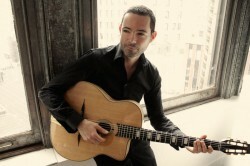 Nolan was encouraged and taught to play the standards of Hank Williams and the subtleties of traditional jazz. However, like many journeymen before him, Nolan’s musical path led him down many roads before securing a place at the Guildhall School of Music in London where he established himself on the capital’s local jazz scene with his own swing quartet. But it was a trip to the annual Django Reinhardt Festival in Samois-Sur-Seine, France with his father and musical mentor in 1991 that changed Nolan’s whole perspective towards music forever. It hit me over the head – it was just intoxicating. Seeing these gypsies … I’d never seen anything like it – how they live and the music and how important that is to them. As soon as I got back to London I started playing that music. Unfortunately for Nolan, the gypsy lifestyle is not something that the London of the early ’90s was ready to embrace. After struggling to find spots to play his music on the street without being moved by the police or going through the endless bureaucracy and red tape to secure a busking pitch, Nolan decided to pack his bags and take his band to a more liberal city by setting his sights on Amsterdam. In 1992 we got into a Volkswagen camper van and all piled over to Amsterdam,” Nolan fondly recalls. “We’d made a cassette in my room in London and we just took a hundred over and we just started playing straight away in Leidseplein Square. Fully embracing the gypsy way, Nolan’s freedom to play wherever and whenever he liked in the streets of Amsterdam led to a whole new artistic independence. Using the world as his stage, Nolan’s time in Amsterdam led to many encounters with people from all over the world and a chance encounter which set in motion a series of harmonious opportunities and lifelong friendships that are still having repercussions to this very day. George Harrison’s old gardener from Friar Park (the Harrison’s home and estate in Henley-On-Thames) came by and bought a CD. He managed to tell George about the music and George said ‘Bring ‘em up and let’s have a party’. It was the summer so we went up to Friar Park and just played around the pool for George, his wife Olivia, his son Dhani, and a few friends. It was just a very nice connection from the beginning. He liked how we were – young and naive and just into the music – no managers or business involved. You could tell he just loved the music. This was just the start of a long and beautiful relationship between Nolan and the Harrisons. Now I usually play a couple of George songs in the set and tell the story of playing at his house and it’s like, everyone was famous … except for us. You look up and there’s Paul McCartney talking to Ringo and Damon Hill, the Formula One racing car driver, it was intense. You could tell that George was proud of us and enjoyed seeing people’s reactions as we played. It was an amazing experience. Nolan is about to release his first “major label” album with the family’s record label, H.O.T. Records Ltd. Right up until now and signing with Dhani and H.O.T. Records I’ve always done it by myself. I couldn’t think of anyone better who understands me and the music. I’ve known Dhani for years, so it feels really natural and good – like keeping it in the family. The new album features a track called “Ravi”, which Nolan says is not just a tribute to the legendary Ravi Shankar, but is also a nod to the Harrison legacy. Even though it’s called “Ravi” it’s a whole melting pot of the feeling I get at Friar Park. I met Ravi there and played with him at George’s wake, which was an intense evening, very emotional. So that song is inspired by Ravi, but is a blues basically and reeks of Harrison – there’s a couple of things in it that sound very George. I do this kind of Indian slide, which is heartfelt and a mix of those two worlds. I was always pretty unorthodox in my approach to Gypsy Jazz. I’ve always done it my own way. Robin Nolan. A true original.